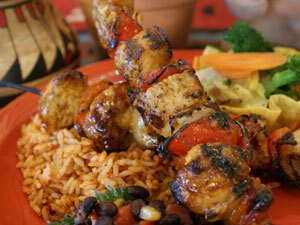 Twin Asada seasoned Chicken Kabobs skewered with Onions ‘n Peppers. Served with Spanish Rice, fresh Vegetables and Roasted Corn ‘n Black Bean Salsa. A Filet of Cod encrusted in crunchy “Baja seasoned” Panko Bread crumbs, pan-seared to a Golden brown and topped with a swirl of “Smokey” Chipotle Aioli and a dusting of Cotija cheese… served with Sweet Potato Fries, fresh creamy Cole Slaw and garnished with our Habanero-Mango ‘n Red Pepper salsa. 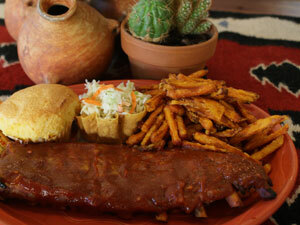 A full rack of Sam’s Award Winning, slow roasted, finger lickin’ BBQ Ribs, served with a Pueblo Corn Muffin, Cole Slaw and Sweet Potato Fries. A 10 oz. “flame grilled & sliced” Bistro-style Shoulder Tenderloin Steak that’s been marinated in our mouth-waterin’ Southwestern Chile seasonings and lightly sprinkled with crumbled Cotija Cheese; grilled to order and served with Sweet Potato Fries, freshly steamed Vegetables and our Roasted Corn ‘n Black Bean salsa. A choice New York Sirloin Steak grilled over an “open-flame”, then brushed with Cuervo Tequila Butter and served up on a platter with a Cheese ‘n Onion Enchilada, Spanish Rice, Black Beans and Sour Cream. For the “meat and potatoes lover”. A grilled to order choice New York Sirloin Steak, served with Sweet Potato Fries, fresh Vegetables and Roasted Corn n’ Black Bean Salsa. Twin Shoulder Tenderloin Steaks that have been marinated in our Southwest seasonings then grilled to order over an open flame and smothered with Sweet Caramelized Onions and crumbled Cotija Cheese; served with Spanish Rice and freshly steamed Broccoli crowns. A flame grilled Asada Chicken Kabob skewered with Pepper ‘n Onions, a Cimmaron Steak smothered with Sweet Caramelized Onions and crumbled Cotija Cheese, a quarter rack of BBQ Baby Back Ribs, Spanish Rice and tonight’s freshly steamed Vegetable. Plump chicken breast coated with a mixture of shredded Toasted Coconut and crunchy Panko bread crumbs, pan-seared and finished with a dark rum, coconut ‘n pineapple sauce. Served with Spanish Rice and fresh steamed vegetables.